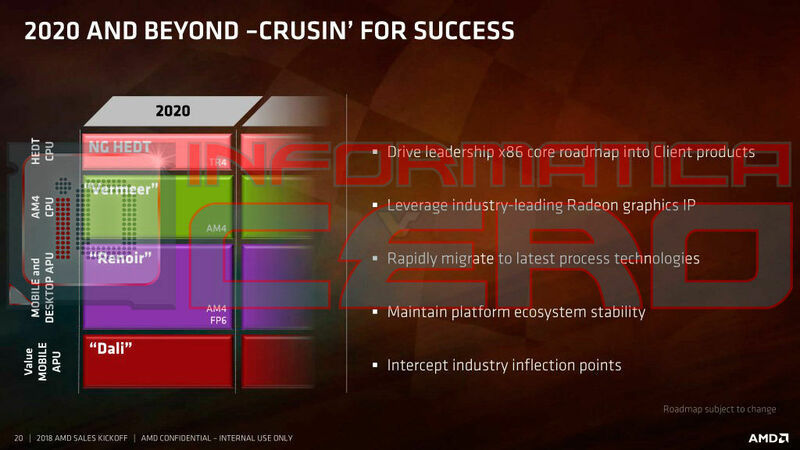 It looks like leak season has come early for AMD as official marketing slides and roadmaps have started leaking ahead of their announcement. 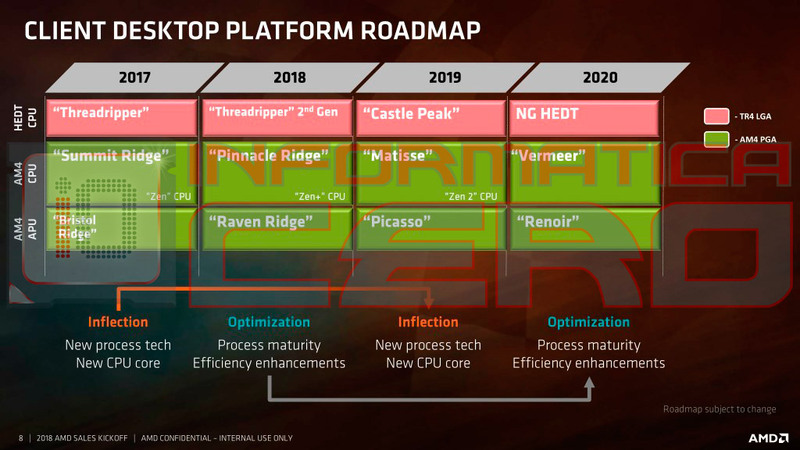 The latest leaked roadmap confirms new details regarding AMD’s HEDT Threadripper processor lineup and confirms AMD’s plans all the way up till 2020. 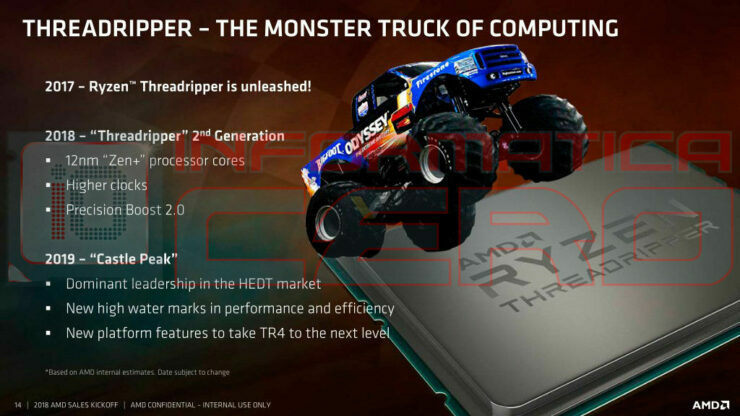 AMD Next Generation Ryzen Threadripper 4000 Series HEDT CPUs Headed For 2020 Launch – Retaining Support on TR4 Socket Makes The Enthusiast Within Me Happy! Coming straight from Informatico Cero (via Videocardz) who are sharing the marketing roadmaps since yesterday, the new details are specific to the Ryzen Threadripper lineup. AMD has shown 3 new Ryzen Threadripper families which will be launched one after another. Yesterday, we came to know that AMD is following a semi-Tick-Tock cadence which involves Inflection and Optimization. The CPUs falling within the inflection period will feature a new process technology and a new CPU core. The ones falling in the Optimization period will feature process maturity and overall efficiency enhancements. The roadmap shown yesterday reveals that AMD has at least three Ryzen Threadripper families up and planned for launch till 2020. Succeeding this years launch is Threadripper 2nd Gen, also to be known as Ryzen Threadripper 2000 series. This has been confirmed officially by AMD and will end up with 12nm Zen+ cores and adopt higher clocks and Precision Boost 2.0 / XFR 2.0 technologies. Next up, we have the Ryzen Threadripper 3rd Gen or 3000 series family which is expected to debut in 2019. This family will be internally known as “Castle Peak” and is stated to bring dominant leader ship in the HEDT market. The family will proof to be a new watermark in performance and overall efficiency while new platform features will be introduced on the TR4 socketed motherboards to take them to the next level. We may be looking at PCIe Gen 4.0 support on these motherboards along with a core count bump which is rumored to be happening on the 7nm EPYC ‘Rome’ series by the end this year. Finally, the last update on the roadmap is 2020’s Ryzen Threadripper 4000 ‘4th Gen’ HEDT CPUs. There’s not much mentioned about these processors except that they will also fall in within the optimization period. This refers to a refreshed / mature node so we may be looking at 7nm+ or 5nm in this case and the launch is reserved for 2020. I think the main thing worth noting is that rather than switching sockets, AMD will retain future Threadripper compatibility on all TR4 socketed motherboards. Sure, there will not be the full feature set available on older TR4 motherboards as new processors launch as seen with the recent Pinnacle Ridge leaks but it’s good to have long term compatibility on older motherboards. Expect more official details in the coming months.